This year I was finally able to do the Los Angeles River Ride myself. 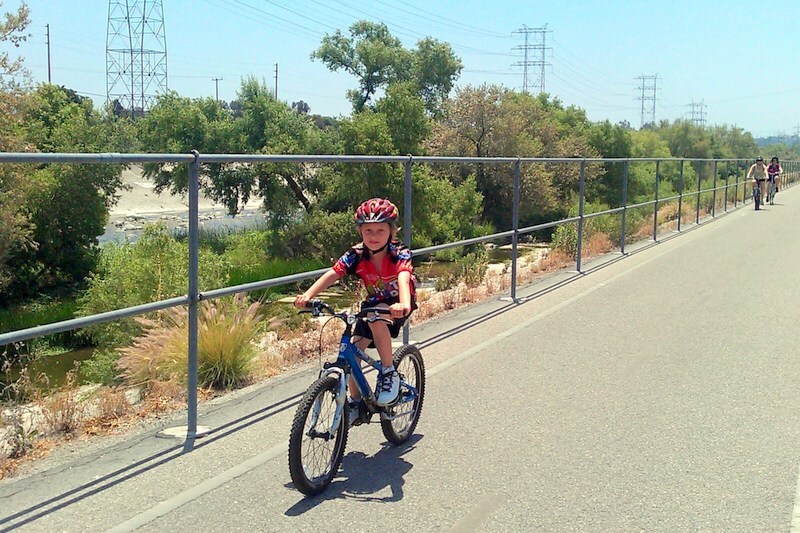 Six years ago our family went to our first LA River Ride, but I wasn’t able to ride it since Doobie was too young for the Family Ride. I stayed with him in the parking lot for the younger riders’ mini-course and bike wash. Only Daddy and Sonny were able to ride along the river. Ever since that year I’ve wanted to ride along the river myself, ideally with the family, but other commitments always interfered. This year was finally my chance. 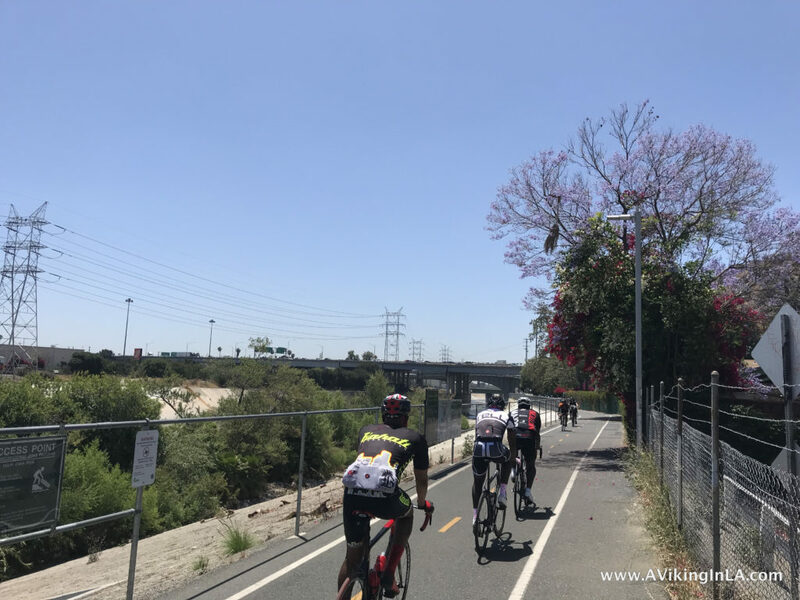 This year’s Los Angeles River Ride took place Sunday, June 3. Both kids had obligations, but I was able to get away to Griffith Park for the event. 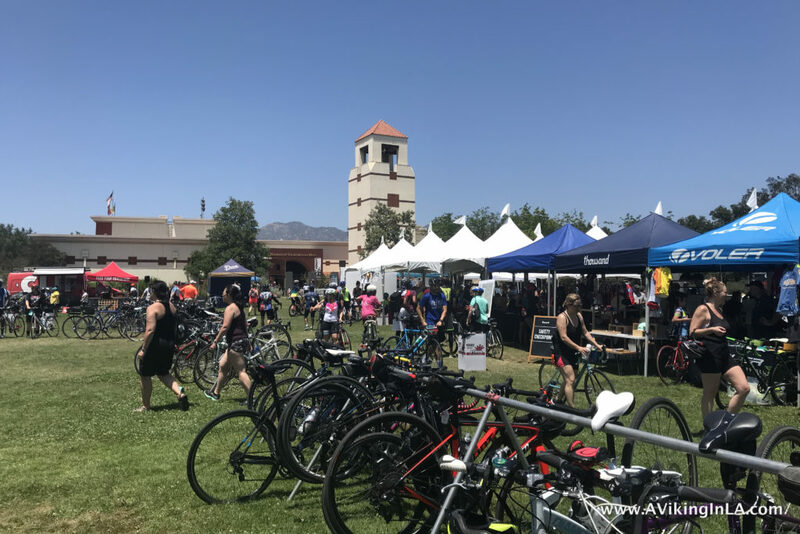 There were several rides to choose from: 2-mile Kids’ Ride, 15-mile Family Ride, 36-mile Ride, 68-mile Metric Century Plus, and Century Ride from Griffith Park to Long Beach and back, each ride starting at a different time in the morning. I chose the 15-mile ride since the next longer ride of 36 miles seemed a little daunting as my first experience (even though we’ve done that and more as a family on cycle tours in Europe previously). There weren’t as many riders at the start line as I had expected, but then again this was the last of the rides to get started. Organizers started us in stages so we wouldn’t overwhelm the road or each other when we started. Due to construction, we had to ride about 3 miles on road through the park to get to the bike path. I had no issue with that, especially since my husband’s one complaint from our last experience was the interference with cars while riding over the freeway to get to the bike path. This year’s route was a little awkward just as we were getting to the bike path. We had to dismount, cross an intersection two ways, walk down a grassy slope, and then wind our way around tennis courts before joining the bike path. But it was not a big issue in the grand scheme of things. 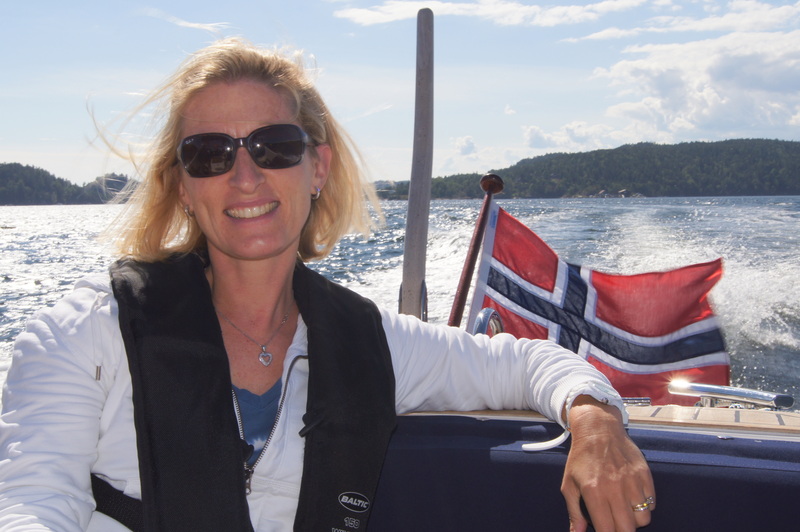 Riding along the river was a wonderful experience. It’s really becoming a much more green space with lots of birdlife and opportunities for recreational use. Even though concrete still played a dominant role and at one point, but for a very short distance, the freeway buzzed by on the other side of the path, you could easily forget you were riding in the middle of big city metropolis. 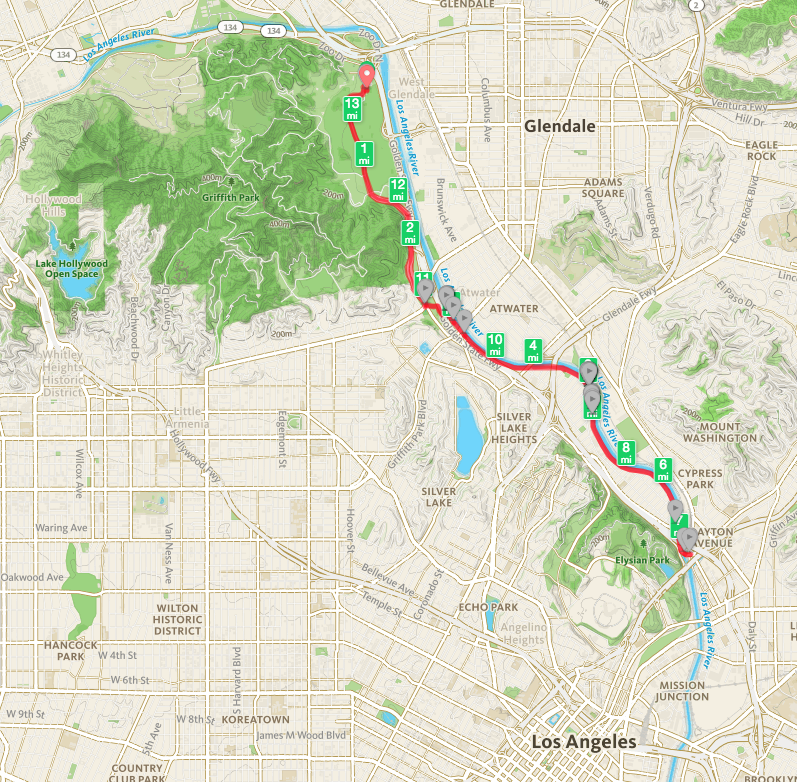 The ride went from The Autry Museum in Griffith Park to Elysian Park and back. The turn-around point was not clear. Luckily, a volunteer had noticed that riders were continuing on and stationed himself so that he could tell us to turn around. One of my favorite moments of the ride was coming upon Spoke Bicycle Café. It was a pit stop along the route. I thought the pit stop was going to be just a table with refreshments along the route so I hadn’t paid much attention to the details of it. It was indeed “just a table with refreshments” but the table was inside this very cool, laid-back, bicycle themed café. Spoke Café was its own little special world. I wished I wasn’t there alone so I could have hung out for a while and enjoyed the atmosphere, live music and all. Another local discovery I made was La Colombe Frogtown, another café right along the bike path. This had a totally different vibe than Spoke Bicycle Café, much more modern and chic. I wasn’t in the mood for coffee, but the cold pressed juice by Liquiteria was perfect. Eventually, it was time to pedal my way back to the start of the ride. I’ve decided that next time I do this event I’ll sign up for the longer ride. This 15-mile ride only took 1 ½ hours (excluding café stops). I would have loved to spend more time along the river. Who’d like to join me next time? 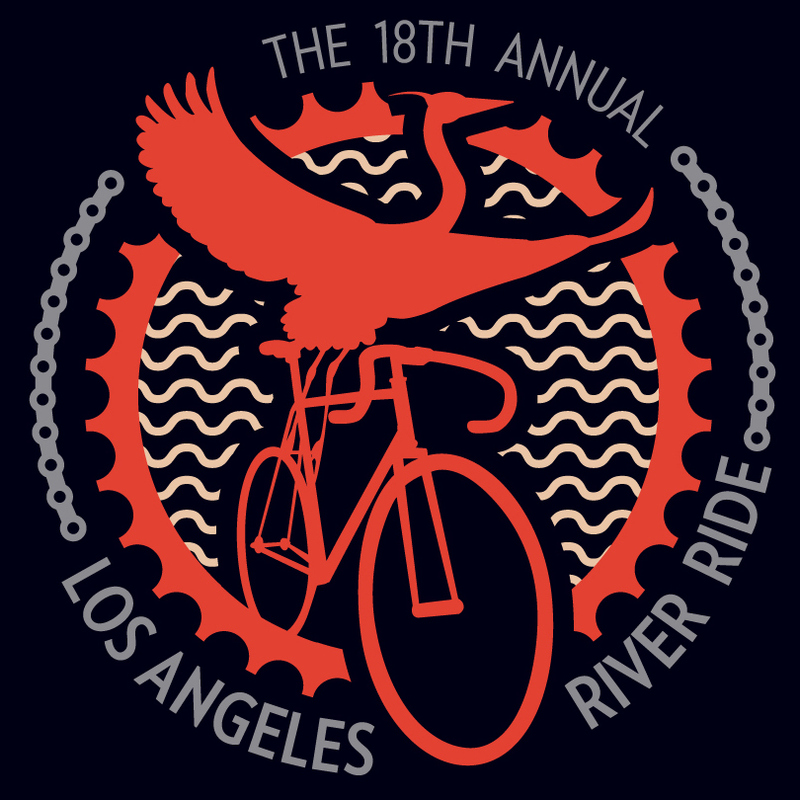 The yearly Los Angeles River Ride is organized by the Los Angeles County Bicycle Coalition (LACBC) which is a membership-based nonprofit organization that works to make all communities in LA County healthy, safe, and fun places to ride a bike through advocacy, education, and outreach. You can help by becoming a member, donating, or joining a bike ride (see below for one coming up soon in Santa Monica! ), plus more. 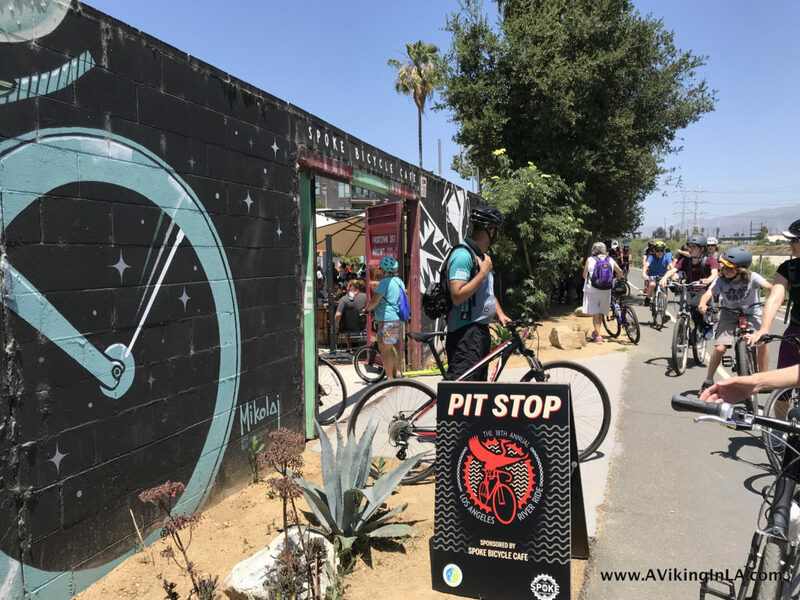 Coming up soon… Sunday Funday: Tour of Santa Monica on Sunday, July 1, 9:30 a.m. – 1:00 p.m. Join LACBC and local chapter Santa Monica Spoke for the first Sunday Funday of the summer season! They’ll be taking in the cool coastal air as they explore the Michigan Ave greenway and get a preview of the 17th St corridor. They’ll be starting out at the 26th Street / Bergamot Station on the Expo Line meeting at 9:30 a.m., rolling at 10:00 a.m. There will be stops and water breaks along the way and is a perfect way to meet people and discover new neighborhoods. RSVP here. This ride is a no-drop ride (no rider left behind) with LACBC Ride Marshals. Riders should be able to keep a 10-12 MPH pace, and cover 12-15 miles. This past weekend, our family did something totally new for us. 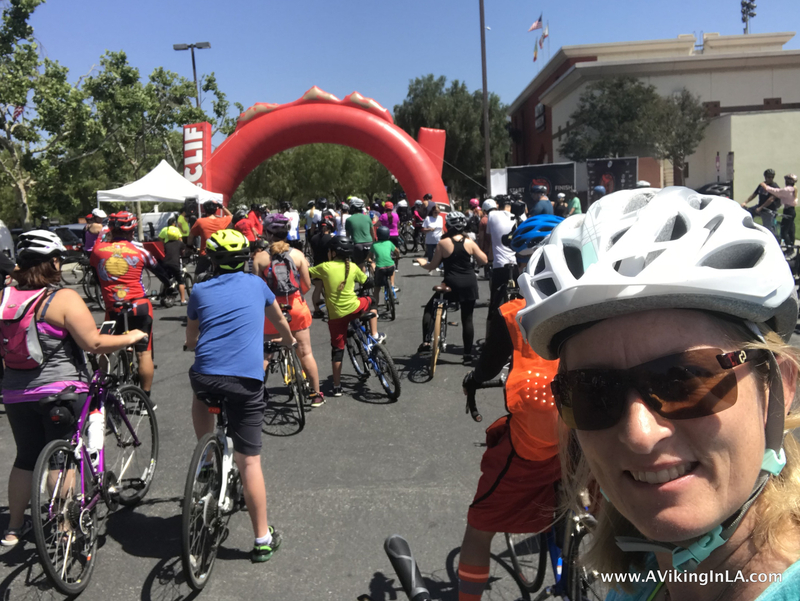 We participated in the 12th annual Los Angeles River Ride presented by the Los Angeles County Bicycle Coalition. I have become increasingly interested in the Los Angeles River. 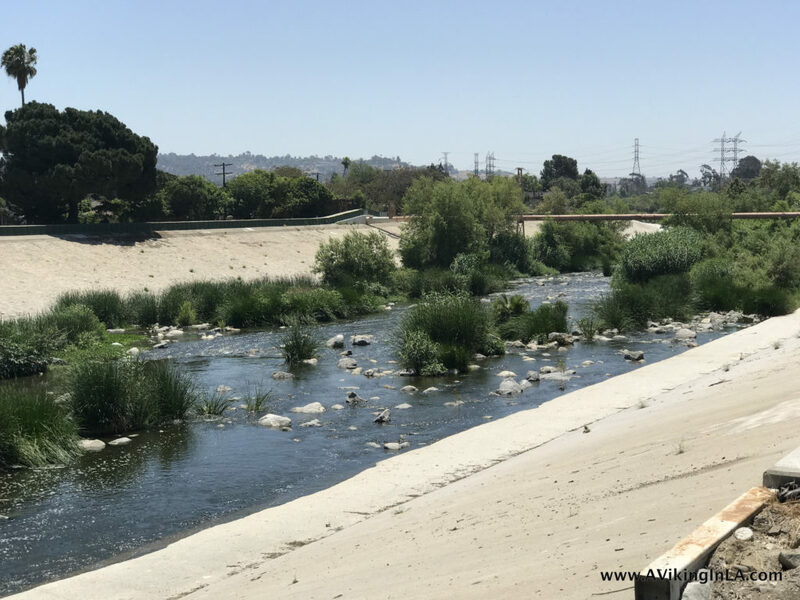 It used to be that I associated the term “Los Angeles River” with an image of a practically empty river bed with wide concrete banks. You often see that image in movies that take place in Los Angeles. Lately, though, I’ve learned more about its history and followed attempts to revitalize and restore interest in it. 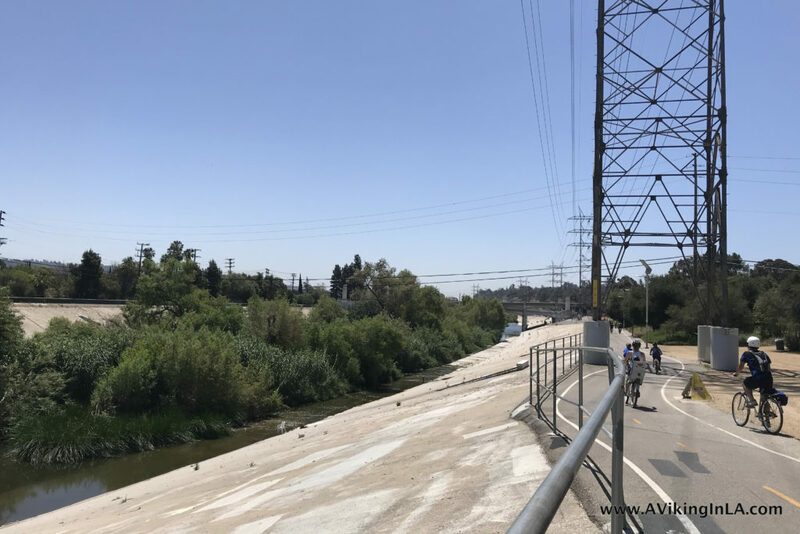 What better way to gain a better appreciation of the LA River than to do a bike ride along part of it! Unfortunately, I didn’t actually get a chance to ride along it. While Sonny and Daddy participated in the 15-Mile Family Ride, I stayed back at the start with Doobie who was too young to ride it. Kids had to be 7 years old in order to participate in the family ride. 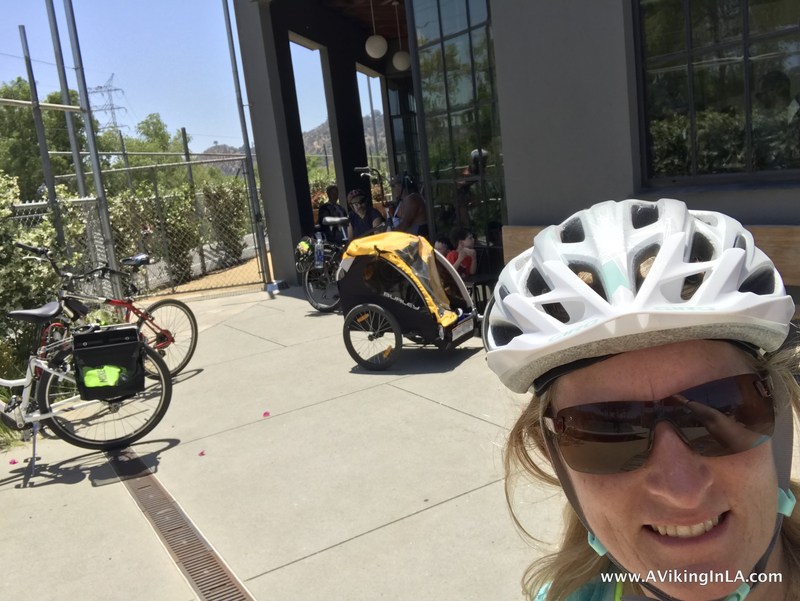 The Family Ride started at the Autry National Center in Griffith Park, crossed the freeway and then continued south on a bike path along the LA River until they arrived in the Elysian Park area (near Dodger Stadium) where they turned around after some refreshments.